The Parthians have been overlooked and underrated by history . 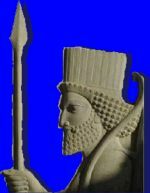 Some historians claim the following Sassans tried to blot out the memory of the Parthians so they could lay claim to be the heirs of Cyrus the Great and the Achaemenians . For nearly five centuries, from the middle of the third century B.C., the Parthian Empire ruled Persia .For most of this long period it was the leading power of the Middle East and the rival of the Roman Empire. 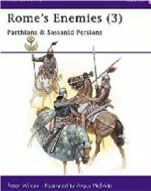 Yet we know very little about Parthia, except when she is brought into contact with Rome, with its many conflicts over Armenia .Unlike the Seulucid empire, the Parthians were able to check the mighty power of Rome, one of the few states of the age to do so . 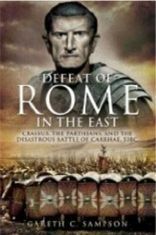 their greatest victory over the Romans was at Carrhae in 53 B.C. , when with the when a new breed of horse was developed than was stronger and could support heavy armour - the cataphract ( bulwarked) and the Parthian composite bow smashed through the legions .At its height under Mithridates II around 130 B.C. , it controlled areas of modern day eastern Turkey, Iran,Syria Iraq,Afghanistan,Armenia,Pakistan, Saudi Arabia and Turkmenistan. The Parthian empire grew rich through heavy custom duties of the traffic between Rome and China on the Silk Road .Goods as well as cultural ideas were exchanged. The Parthians ensured the safety of the caravans . Roman trade deficits with China grew so excessive that the Roman senate tried to ban the wearing of silk . The Parthians were a nomadic tribe, probably akin to the Turkoman. Their royal house was named after a chief Arsaces. It is possible that this was not a personal name, but was adopted to connect the new dynasty with that of the Achaemenians, for Artaxerxes II was also called Arsaces. Under Mithridates I around 171 B.C it began to grow at the expense of the Seleucid empire. Its most powerful weapon was its famous cavalry. 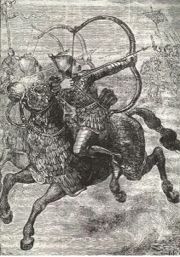 the once nomadic horsemen introduced many features of knighthood and chivalry to the Europe, including coats of arms and jousting .Parthia was plagued by fratricide and patricide, lack of organization and exhausting wars with Rome .It was overthrown by a rebellion of Persian prince Papak in 226 A.D.. The location of ancient Parthia corresponded to the modern Persian province of Khorasan, south-east of the Caspian Sea . The Parthians do not appear in history until a comparatively recent period. They obtain no mention in the Zendavesta. The Assyrian Inscriptions are wholly silent concerning them. It is not until the time of Darius Hystaspis that we have trustworthy evidence of their existence as a distinct people. In the inscriptions of this king we find their country included under the name of Parthva or Parthwa among the provinces of the Persian Empire, joined in two places with Sarangia, Aria, Chorasmia, Bactria, and Sogdiana, and in a third with these same countries and Sagartia. 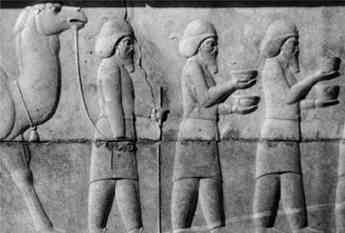 Herodotus spoke of them as a people subject to the Persians in the reign of Darius, and assigned them to the sixteenth satrapy, which comprised also the Arians, the Sogdians, and the Chorasmians. He said that they took part in the expedition of Xerxes against Greece (B.C. 480), serving in the army on foot under the same commander as the Chorasmians,On this point, Strabo, Justin, and Arrian are agreed. The manners of the Parthians had, they tell us, much that was Scythic in them. Their language was half Scythic, half Median. They armed themselves in the Scythic fashion. They were, in fact, Scyths in descent, in habits and in character. If, however, the consideration of the Parthian language does not help us to determine their race, a consideration of their manners and customs strengthens much the presumption that they were Turanians. 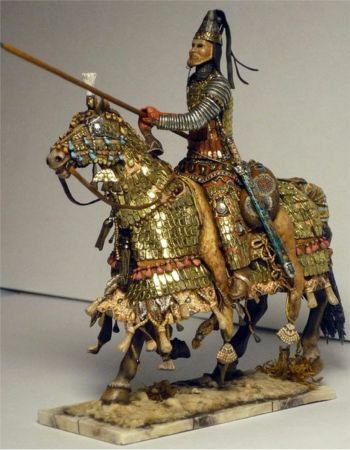 Like the Turkoman and Tatar tribes generally, they passed almost their whole lives on horseback, conversing, transacting business, buying and selling, even eating on their horses. They practiced polygamy, secluded their women from the sight of men, punished unfaithfulness with extreme severity, delighted in hunting, and rarely ate any flesh but that which they obtained in this way, were moderate eaters but great drinkers, did not speak much, but yet were very unquiet, being constantly engaged in stirring up trouble either at home or abroad. Rebellion against the Seleucids . But in Parthia Greek rule was from the first cast aside. The natives rebelled against their masters. An Asiatic race of a rude and uncivilized type, coarse and savage, but brave and freedom-loving, rose up against the polished but effeminate Greeks who held them in subjection, and claimed and established their independence. The Parthian kingdom was thoroughly anti-Hellenic. It appealed to patriotic feelings, and to the hate universally felt towards the stranger. It set itself to undo the work of Alexander, to cast out the Europeans, to recover to the Asiatics the possession of Asia. It was naturally almost as hostile to Bactria as to Syria, although danger from a common enemy might cause it sometimes to make a temporary alliance with that kingdom. It had, no doubt, the general sympathy of the populations in the adjacent countries, and represented to them the cause of freedom and autonomy. From 311 BC Parthia then became a part of the Seleucid empire, being ruled by satraps under a Seleucid king.The exact circumstances under which the Parthian revolt took place are involved in much obscurity. According to one account the leader of the revolt, Arshak or Arsaces in Greek , was a Bactrian, to whom the success of Diodotus was disagreeable, and who therefore quitted the newly-founded kingdom, and betook himself to Parthia, where he induced the natives to revolt and to accept him for their monarch. Another account, which is attractive from the minute details into which it enters, is the following:? "Arsaces and Tiridates were brothers, descendants of Phriapites, the son of Arsaces. Pherecles, who had been made satrap of their country by Antiochus Theus, offered a gross insult to one of them, whereupon, as they could not brook the indignity, they took five men into counsel, and with their aid slew the Pherecles. They then induced their nation to revolt from the Macedonians, and set up a government of their own, which attained to great power." A third version says that the Arsaces, whom all represent as the first king, was in reality a Scythian, who at the head of a body of Parni , nomads inhabiting the valley of the Attrek (Ochus), invaded Parthia, soon after the establishment of Bactrian and Sogdiana independence, and succeeded in making himself master of it. 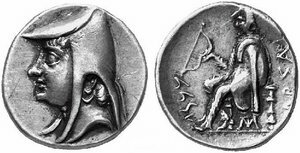 With this account, which Strabo seems to prefer, agrees tolerably well that of Justin, who says that "Arsaces, having been long accustomed to live by robbery and rapine, attacked the Parthians with a predatory band, killed their satrap, Andragoras, and seized the supreme authority." As there was in all probability a close ethnic connection between the Dahae and the Parthians, it would be likely enough that the latter might accept for a king a chieftain of the former who had boldly entered their country, challenged the former Seleucid satrap Andragorasor Pherecles, ( who had declared himself king of Parthia as Bactria )in 238 B.C. to an battle, and by defeating and killing him freed them?at any rate for the time?from the Greek yoke. An oppressed people gladly adopts as chief the head of an allied tribe if he has shown skill and daring, and offers to protect them from their oppressors. This was the beginning of the Parthian or Arsacid rule, lasting from 247 B.C. to 226 A.D. The revolt of Arsaces has been placed by some as early as the year B.C. 256. The Bactrian revolt is assigned by most historians to that year; and the Parthian, according to some, was contemporary. The best authorities, however, give a short interval between the two insurrections; and, on the whole, there is perhaps reason to regard the Parthian independence as dating from about B.C. 250. This year was the eleventh of Antiochus Theus ( The God ), and fell into the time when he was still engaged in his war with Ptolemy Philadelphus. It might have been expected that when he concluded a peace with the Egyptian monarch in B.C. 249, he would have turned his arms at once towards the east, and have attempted at any rate the recovery of his lost dominions. But, as already stated, his personal character was weak, and he preferred the pleasures of repose at Antioch to the hardships of a campaign in the Caspian region. So far as we hear, he took no steps to re-establish his authority; and Arsaces, like Diodotus, was left undisturbed to consolidate his power at his leisure. Arsaces lived, however, but a short time after obtaining the crown. His authority was disputed within the limits of Parthia itself; and he had to engage in hostilities with a portion of his own subjects. We may suspect that the malcontents were chiefly, if not solely, those of Greek race, who may have been tolerably numerous, and whose strength would lie in the towns. Hecatompylos ( Greek for ' one hundred gates '), the chief city of Parthia, was among the colonies founded by Alexander; and its inhabitants would naturally be disinclined to acquiesce in the rule of a "barbarian." Within little more than two years of his coronation, Arsaces, who had never been able to give his kingdom peace, was killed in battle by a spear-thrust in the side; and was succeeded (B.C. 247) by his brother, having left, it is probable, no sons, or none of mature age.